Hitchhiking in Taiwan Involves $100K Lexuses, Who Knew? My trip to Taiwan had been fantastic so far, but it was just about to get epic during our trip to the tea fields. Want to see how? Read the full story below! Monday was our final full day in Taiwan and we certainly made the most of it. It began with all of us taking a bus out to Ping Lin where they grow tea to see it done up close and personal and learn about the whole, involved process. The first thing we did upon arriving was go to the tea museum where I learned all about the different kinds of tea grown in Taiwan, how involved, labor intensive and intricate the act of actually making tea is, and how to properly drink tea – of course there’s a proper technique to it. 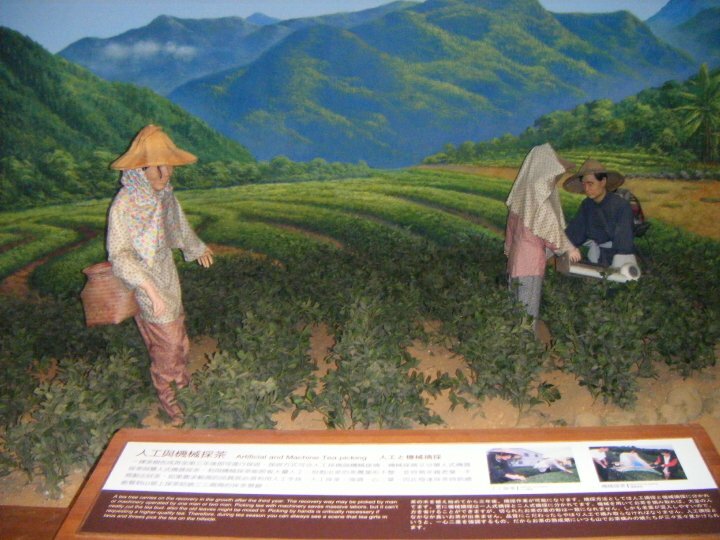 An example of tea harvesting in the Tea Museum in Ping Lin. 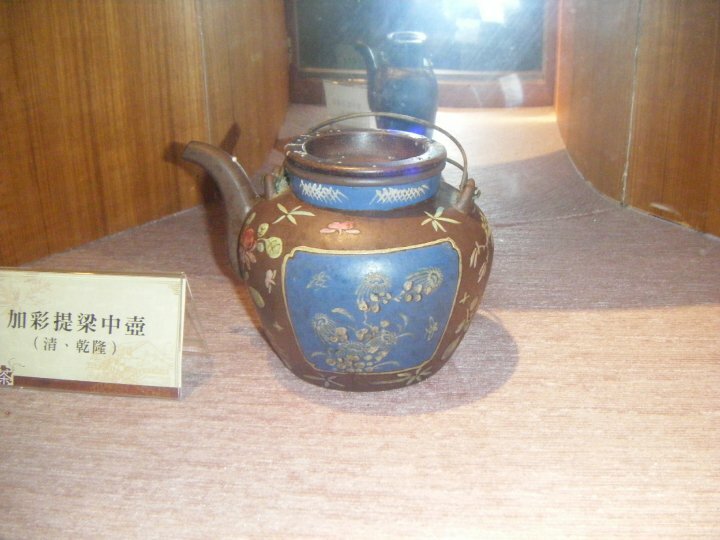 Teapot at the Tea Museum in Ping Lin. After we got done there, we caught a little shuttle bus to the tea fields where we intended to rent bikes and ride around the fields. The bus, however, dropped us off nowhere near a bike store, so we set off in search of one. We ended up at this little open air restaurant in the middle of nowhere, and a kind woman who was Taiwanese but lived in New York for the past 20 years befriended us and translated to the restaurant owner we were looking for a bike rental. The owner proceeded to call the bike shop we should have been at, and after ascertaining how much a rental for an hour would be (about $2.75 USD), beckoned us into the back of his pickup truck and drove us the thirty minutes to the bike shop for free! Can you believe the hospitality of these people? But just wait, the story gets better. 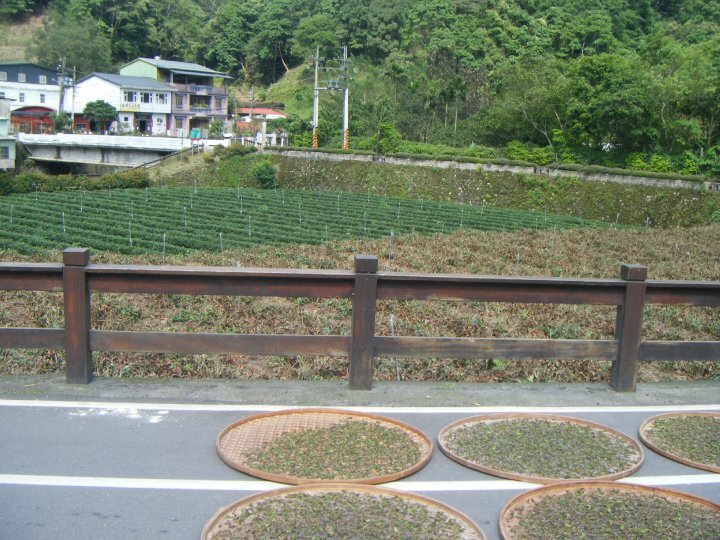 Some of the tea fields and tea drying in the sun we saw while riding bikes. Finally we rented the bikes we were after, rode around the roads and dirt tracks between the tea fields, Cameron gashed his toe open at one point (he made the mistake of wearing flip-flops to ride bikes), sweated like crazy (the humidity and heat of Taiwan was similar to that of Hong Kong), got extremely dirty and finally returned the bikes an hour and a half later. Now Lucas and I had seen a small temple when we rode past a certain spot earlier and we wanted to go check it out, while the others wanted to sit and wait at the bus stop. Ok, fine. We hiked over to the little temple, took some pictures, looked at it, and then saw one of the buses back to Ping Lin coming. As we tried in vain to flag it down, the driver motioned that it was already full. When we signaled to it and watched it pass, however, a Lexus driving by stopped, and the passengers who spoke virtually no English, just waved us in! The fancy Lexus Lucas and I hitchhiked in. I can’t hitchhike in anything less now – I won’t. To fully set the stage you must understand that Lucas spoke a smattering of Mandarin at this point (from what he learned at school), we were both dirty and sweaty and not exactly model hitchhiking foreigners, and we were riding in the leatherback seats of a $140,000 USD Lexus (Cameron estimated the price, including the high import tax in Taiwan, when we saw these people again in Ping Lin, I kid you not, we ran into them again)! We didn’t know quite where these kind people were taking us, but the fact that they took it upon themselves to help us out in the state we were in is still shocking to me. I wouldn’t have picked Lucas and I up in that state without thinking twice. They ended up driving us back to our very first bus stop where we originally got lost and found the little restaurant, and they periodically checked back with us to make sure we were okay and still at the bus stop while we waited to get picked up. Absolutely amazing! Taiwan had the nicest people I’d ever met, hands down! The bus did finally arrive and we all made it back to Ping Lin without further incident, but how cool was that? Lucas and I inadvertently hitchhiked in a super expensive Lexus! Seriously! We made a return trip to the Ximending and Nangxia night markets that night, bought souvenirs, ate street food, and ended yet another epic day in Taiwan. Longshan Temple and all the tourists that naturally came with it. The last half day we were in Taiwan, Lucas left on an earlier flight, and Cameron was staying an extra day to visit a friend, so Merelyn, Janet, and I had a half a day to bum around before our flight at 4:30 that afternoon. We decided to each do our own thing (everyone was still cool with one another, but a little apart time couldn’t hurt), and I chose to go temple seeing. I got up earlier than usual and was out at Longshan Temple (one of the most famous in Taipei) before 10:30 AM. It was so worth it – absolutely stunning to see up close and personal, and then I walked through one of the most graphic wet markets I’ve ever been in. 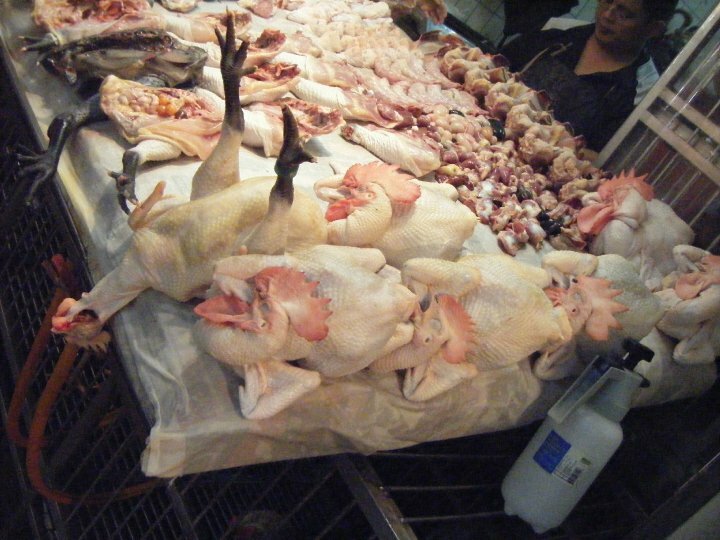 I saw not just fresh animal carcasses for sale, but the heads and hooves and claws of pigs and chickens as well! A little shocking, but not nearly as shocking as it would have been four months prior. 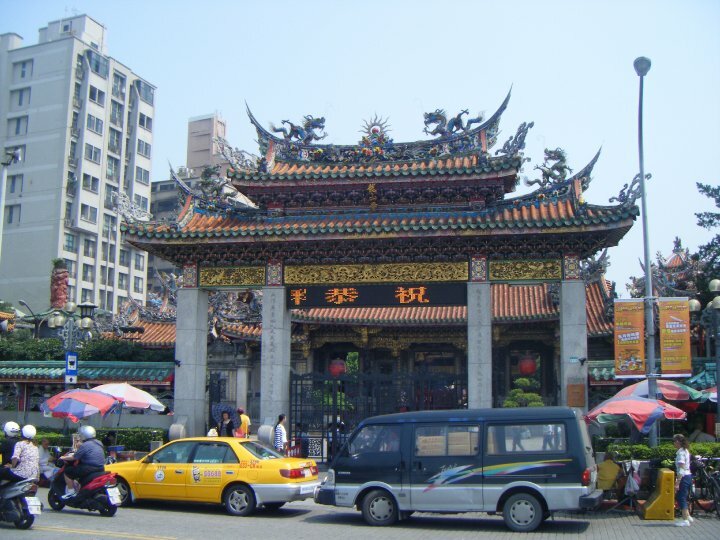 I also saw the Shandao Temple, before the blistering heat and sunlight drove me into the air conditioning of Zhongshan Metro Mall and then a really upscale mall (where they happened have a NY Bagel Restaurant of all things) above Taipei Main Station. At 1:30, the three of us reconvened at the hostel, grabbed our bags, and hopped on the high-speed train (yep, that’s right, I got to ride a high-speed train in Taiwan – top speed of 214 mph, thank you very much) back to the airport and got on our flight back to Hong Kong. We arrived in Hong Kong around 6:30 and by 9 PM I was back in my room unpacking from the most fun trip I’d had thus far in Asia! It was truly the experience of a lifetime (the whole semester was the experience of a lifetime, honestly). But the fun’s not quite over yet. Stay tuned for my next blog post. The semester was winding down, but that just meant we had to pack our remaining days even more full. It’s going to be a whirlwind! P.S. On the Taiwan trip alone (4.5 days) I took 691 pictures! 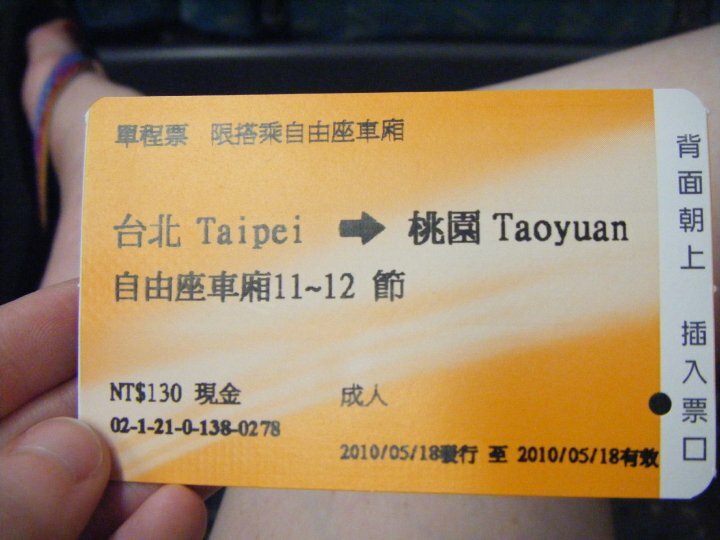 My high-speed ticket to the Taipei airport. This entry was posted in Asia, Taiwan and tagged Asia, Bicycle, Bike, Hitchhike, Lexus, Night Market, Ping Lin, Shopping, Taiwan, Tea, Temple, Travels on May 7, 2014 by Paige N..